Do you know the story of the first Christmas, the entire story, not just what you have seen on Christmas specials or heard in Christmas hymns? Take a few minutes each day for the next 40 days to read about the events leading up to this holiest of nights. Meet the people who were there, Elizabeth, Zachariah, the Angel Gabriel, Mary and Joseph. Travel across the Judean countryside to Nazareth and on to Bethlehem. Witness the birth of Jesus as you never have before. -Spend 40 days strengthening your faith. -Spend 40 days drawing closer to God. 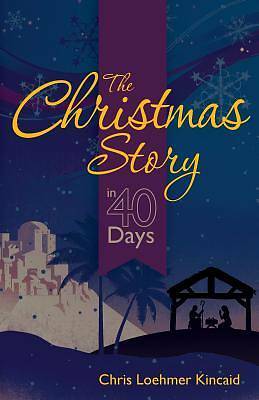 -Spend 40 days getting to know your Savior Jesus Christ. About the Author Chris Loehmer Kincaid lives in northern Wisconsin with her husband, one dog, and four cats. Her first book, A Time for Every Purpose under Heaven, shares the story of her mission trip to Africa and answers the question, "Can one person make a difference?"